This Saturday, October 7, Century Downs Racetrack and Casino will be hosting Pioneer Day. This day is prepared with the intention to honour pioneers of Thoroughbred racing, showcase its history, and bring back horsemen, owners, breeders and fans who may not have not been in the industry since the closure of Stampede Park. 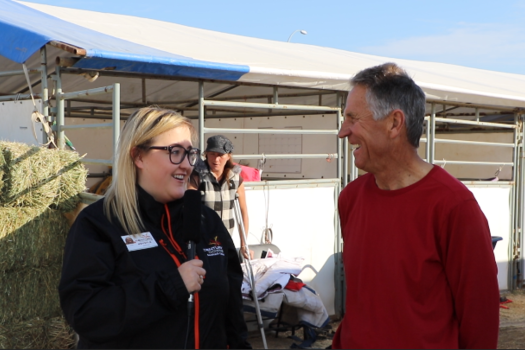 To leap into celebrating pioneers here in Alberta, we caught up with former jockey, and current trainer and exercise rider Rod Haynes. Haynes is looking forward to spending some more time with his young grandchildren. Haynes had one horse in on Saturday, September 30 HOPEWICK. “She’s just a nice honest mare,” said Haynes. “She’s run very well [over] the last few years.” In the final race of the day, there was a field of eight, there was HOPEWICK (Williams) with the odds of 21/1. It was a slow start out of the gate, as LAST FLIGHT (K. Balgobin), LADY AMELIA (Welch) and CLASSYSHADESOFGREY (Walcott) were duking it out throughout most of the race. PICK A PRIZE (Muir) and HOPEWICK were sitting way back behind the crowd until the final bend when HOPEWICK starting gaining ground, took it wide, and strutted into third place behind LADY AMELIA and PICK A PRIZE. We’re hoping to see more of Rod Haynes and his horses here at Century Downs for this season, and wish him the best of luck to his retirement. Watch and wager live racing every Saturday and Sunday at 12:50 p.m., and enjoy racing on Thanksgiving Monday at 3:10 p.m.